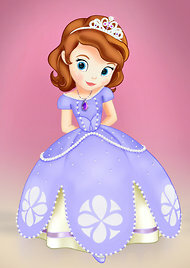 According to The New York Times, Disney is hard at work on a new animated television show, featuring yet another princess, this time aimed at the younger crowd: the show is entitled Sofia the First, and the protagonist is apparently around five, Disney's aim apparently being to attract the youngest viewers. The character looks cute, and her show will probably be more wholesome than those teen shows that the Disney Channel has been turning out in recent years, and since I try to avoid indulging in the Disney-hate popular these days on both the right and the left, I wish the show's creators all the best, though knowing Disney's history, I doubt Sofia the First will manage to come up with any important life lessons aside from "Believe in Yourself, Whatever That Means." Image Blatantly Stolen from the Source because This Is a Small Blog and I Can Get Away with That. Also, Awwww. Whoa, one of those has already actually happened since that parody was made. Well, considering that the film adaptation of Battleship is coming out in the near future, this seems apropos. Also, I just want to mention that I thought Care Bears was hella lame, even when I was a kid. Where was I? Ah, yes. The real reason I'm posting on this topic is because I'm creeped out--again--by the comments appearing under the article. The article on Sofia the First, I mean, which I was talking about before I got off track. Joyless politically correct types, or maybe just people who enjoy the ever-popular sport of Hatin' on Disney, are angry at this new show, even though it doesn't exist yet, because it's about a princess. Yikes. If nothing else, we can say that political correctness is no fun. I don't really understand the complaints being made. Princesses are bad role models, or something, and little girls only like princesses because princesses are presented to them in their entertainment, and little girls would like exactly the same things as little boys if only we didn't give them little girl entertainment instead, or something. The idea that girls might dream of being princesses or enjoy girlish things because they're girls is apparently too much for the PC types to wrap their minds around. If I had George MacDonald in front of me, I'd quote him, but I don't, so I'll paraphrase him from memory instead. In the original serial publication of The Princess and the Goblin , he has a footnote in which he imagines a frustrated reader asking him why his protagonists are always princesses, and MacDonald, being a wise man, replies that he wants the reader to understand that every little girl is a princess. Looking at the angry objections to Sofia the First offered before the first episode has even come out, I'd say we need a good dose of MacDonald's wisdom. Just to give silent support to the project over and against the naysayers, I might even be there to catch the pilot episode, though I make no promise that I will last longer with it than I did with Dora . . . However, if they ever have the Very Special Episode in which Sofia meets up with Dora to find some crystal in the deep jungle, and they end up in a running gun battle or something, call me. That's what children's cartoons should be like.